In this blog post, I’ll analyze the architecture of Apache Kudu based on the paper Kudu: Storage for Fast Analytics on Fast Data. Whenever relevant, I’ll compare the architecture design against known architectures and Big Data technologies. Since I’m more Apache Cassandra-biased, most of the time the comparison will be done of course against Cassandra. All the text in block quote are just excerpts from the Apache Kudu paper. Every thing else is my comments. I have highlighted relevant keywords in the abstract of the paper. Hadoop ecosystem: → strong bias toward master/slave architecture. That’s a lot to be deduced from the abstract, worry not, we’re going to deep dive very soon into the details. II Why Apache Kudu ? In the Hadoop eco-system, there is already a bunch of components/technologies, why yet-another storage engine ? What are the new things does Apache Kudu bring to the table ? So the paper acknowledges the fact that existing Hadoop structured storage like HDFS or Apache Parquet fall short on the requirements of fast individual record updates and random access. However, there is an inaccurate statement about Apache Cassandra. It is not a semi-structured stores. Since the introduction of CQL (version 3) back in 2013 (the paper is written in 2015), Cassandra has a strong schema, unless you use the old and soon-deprecated Thrift API. So Apache Kudu has been designed to provide fast sequential data access as well as low latency single record random access to the data. Since there is no silver bullet in life and every architecture choice is a question of trade-off, the alert readers should understand that Apache Kudu will not be as fast as Apache Cassandra for random access and neither as fast as Apache Parquet for pure sequential workload. Rather it’s a conscious choice to offer those 2 conflicting objectives by relaxing the pure performance side. The design choice for the data store is, as expected, a strong schema system. Interesting enough, Apache Kudu offers the possibility to declare a column nullable. This implies that there is a control on inserted values at runtime. The definition of primary key is pretty standard. The fact that Apache Kudu offers uniqueness constraint implies necessarily a read-before-write (e.g. checking for existence of the row before inserting it). This check can be done directly on the data files or via an index structure like Bloom Filter for performance reasons. This data model is familiar to users of relational databases, but differs from many other distributed datastores such as Cassandra. MongoDB, Riak, BigTable, etc. The design choice about ALTER TABLE with regard to normal and primary key columns is almost identical to what exist in Apache Cassandra CQL. After creating a table, the user mutates the table using Insert, Update, and Delete APIs. In all cases, the user must fully specify a primary key – predicate-based deletions or updates must be handled by a higher-level access mechanism (see section 5). Apache Kudu does not allow multi-partition transactions, despite having Raft as a consensus protocol. The reason is quite simple. As many master/slave – multi-master distributed systems, the data are distributed across different shards. Each shard has its own primary (understand master) replica + slave replicas. Allowing multi-partition transactions means that there should be a consensus protocol or a distributed lock that spans across shards. Even if it is technically feasible with Raft, the performance penalty would be very high. Modifications within a single row are always executed atomically across columns. Pretty similar to what happens with Apache Cassandra. Indeed all mutations that occur in a single partitions can be guaranteed to be atomic since the mutations only impact a single shard. Providing atomicity in a single shard means providing atomicity of updates on the primary/master replica, no real technical challenge here. Here we are, this part is extremely important to understand, every word counts! 1: In the current beta release of Kudu, this consistency support is not yet fully implemented. However, this paper describes the architecture and design of the system, despite the presence of some known consistency-related bugs. Next, the paper claims that such snapshot consistency will necessarily guarantee read-your-writes consistency (equivalent to QUORUM in Cassandra) from a single client, which is pretty obvious since the former has stronger requirements than the latter. Please notice the small  footnote. At the time the paper was written the snapshot isolation is not fully implemented because of some known consistency-related bugs. Who said distributed systems is hard ? By default, Kudu does not provide an external consistency guarantee. External consistency is also known as strong consistency for transactions or linearizable isolation. Those guarantees are very hard to achieve and has a huge cost on performance. Really interesting details here. The alternative to synchronizing client clock is to use the commit-wait protocol inspired by Spanner. But since no one can afford atomic clocks synchronized by GPS systems in his data centers, the latencies cost is dramatic. But at least the users have the choice. Trade-off as always. The assignment of operation timestamps is based on a clock algorithm termed HybridTime. Please refer to the cited article for details. Without going into the detail of HybridTime algorithm and research paper, what you should know is that all clients choosing this algorithm for consistency on writes must make sure that the timestamp that is received from the server is propagated to other servers and/or clients. Which is a rather strong requirement in a system where you may have hundreds of servers and maybe more clients. This restriction is understandable and logic when Apache Kudu uses the HybridTime algorithm for its consistency management. This feature is quite interesting, it means that Apache Kudu should keep some kind of history for each row and column ? I love this sentence, that’s what I used to call the wrong rhetoric objection. For large tables where throughput is important, we recommend on the order of 10-100 tablets per machine. Each tablet can be tens of gigabytes. So for high throughput, maximum recommendation is 100 tablets per machine, and each tablet can be ~10Gb big, which give us max ~1Tb worth of data per machine. This is the maximum density per node, not very impressive for compared to pure analytics dedicated technologies where node density can be 10Tb or more. It’s true that the Apache Cassandra community strongly recommends using hash-based partitioners (RandomPartitioner or Murmur3Partitioner) and avoid at all cost the old ByteOrderPartitioner because of potential hotspots. Apache Kudu claims to have flexible partitioning schemes, what is this magic ??? Be patient! This description fits exactly the definition of token ranges in Apache Cassandra. Good ideas get re-used, no surprise. For anyone familiar with Apache Cassandra, Apache Kudu hash partitioning rule ~ partition key columns (for data distribution) and range-partitioning rule ~ clustering columns (for sorting and range scans). Users always specify rows, partition split points, and key ranges using structured row objects or SQL tuple syntax. Although this flexibility in partitioning is relatively unique in the “NoSQL” space, it should be quite familiar to users and administrators of analytic MPP database management systems. When creating a table, the user specifies a replication factor, typically 3 or 5, depending on the application’s availability SLAs. Kudu’s master strives to ensure that the requested number of replicas are maintained at all times (see Section 3.4.2). The first sentence just show similarities between Apache Kudu and Apache Cassandra with regard to replication factor. The second sentence is more curious. It sounds like in the face of one data server failure, Kudu will try to replicate the data to another data server to restore the replication factor. We’ll see later all the practical implications of such design choice. Kudu employs the Raft consensus algorithm to replicate its tablets. In particular, Kudu uses Raft to agree upon each tablet. When a client wishes to perform a write, it first locates the leader replica (see Section 3.4.3) and sends a Write RPC to this replica. Indeed, it seems to have one Raft leader/master for each tablet (~ Apache Cassandra token range). The role of the Raft leader, as specified in Raft paper, is to reach consensus on all Raft followers. Please note that this Raft leader is different from the Master server mentioned earlier in the paper, the later is dedicated to metadata and cluster topology change. If the client’s information was stale and the replica is no longer the leader, it rejects the request, causing the client to invalidate and refresh its metadata cache and resend the request to the new leader. If the replica is in fact still acting as the leader, it employs a local lock manager to serialize the operation against other concurrent operations, picks an MVCC timestamp, and proposes the operation via Raft to its followers. If a majority of replicas accept the write and log it to their own local write-ahead logs, the write is considered durably replicated and thus can be committed on all replicas. : Kudu gives administrators the option of considering a write-ahead log entry committed either after it has been written to the operating system buffer cache, or only after an explicit fsync operation has been performed. The latter provides durability even in the event of a full datacenter outage, but decreases write performance substantially on spinning hard disks. So there we learn that there is a local lock manager to serialize operations in the face of concurrent updates. In Apache Cassandra, within the class AtomicBTreePartition we also have similar pessimistic locking. Using Raft consensus, the updates are agreed on a majority of replicas, which is pretty equivalent to Apache Cassandra QUORUM consistency with a dedicated coordinator for each token range (which is quite different from pure Apache Cassandra QUORUM where any-node can be coordinator). Please notice the small  note. Again flushing updates to write-ahead log (WAL) is not as obvious as it seems because you face the OS filesystem cache. You have the choice either to completely rely on the OS filesystem buffer but then you don’t have no absolute durability or you can force an fsync call on every flush at the expense of latency. Similarly in Apache Cassandra you can configure the property commitlog_sync in cassandra.yaml to either batch or periodic for the desired outcome. If the leader itself fails, the Raft algorithm quickly elects a new leader. By default, Kudu uses a 500-millisecond heartbeat interval and a 1500-millisecond election timeout; thus, after a leader fails, a new leader is typically elected within a few seconds. 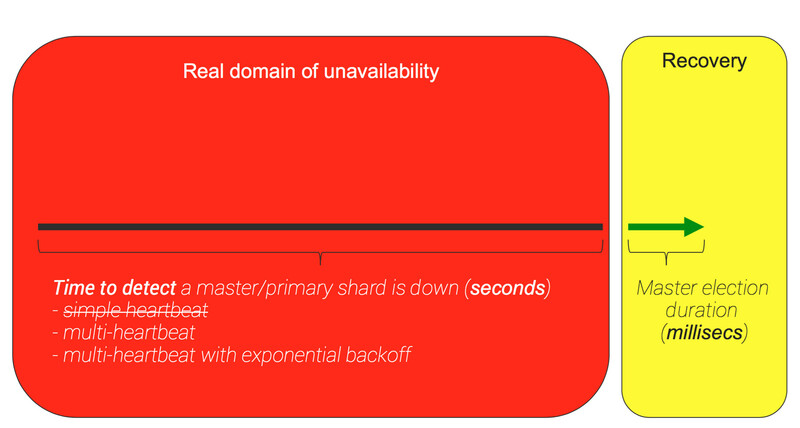 Ok so we’re at the heart of the unavailability domain I mentioned earlier. The paper says 500-millisecond heartbeat interval but does not specify how many heartbeats are required before declaring a Raft leader dead. Repeating myself again, it’s more important to know how long it does take to detect and declare a Raft leader dead rather than how long it take to elect a leader. Next, all the 3.3.1 Configuration Change chapter in the paper discusses about how to increase replication factor efficiently and in a robust manner. This scenario is quite rare but can occur in production. The proposed design is to rely on a one-by-one algorithm. If the current replication factor is 3 and we want to increase it to 5, the idea is first to increase it to 4. So we have the complete path 3 → 4 then 4 → 5. The issue is when increasing from 3 → 4, the new replica has not received yet all the data and WAL from the leader but it can already participate as a Raft VOTER. Now if one of the original replica fails during the data transfer, strict majority of 4 VOTER is 3, including the pending joining replica which isn’t fully functional yet. So there is a risk of unavailability. To solve this issue, the paper proposes to introduce the idea of PRE_VOTER e.g. the new replica does receive live updates from the Raft leader but does not count as a voter until it is fully functional. Does this smart behavior remind you of Apache Cassandra bootstrapping new node and moving data around ? The new nodes does receive new updates as well as the existing data by streaming but does not account for the requested consistency level. Smart ideas get re-used! Act as a catalog manager, keeping track of which tables and tablets exist, as well as their schemas, desired replication levels, and other metadata. When tables are created, altered, or deleted, the Master coordinates these actions across the tablets and ensures their eventual completion. Act as a cluster coordinator, keeping track of which servers in the cluster are alive and coordinating redistribution of data after server failures. I’ll not dig into the details of how the Master manages the catalog metadata and all the failure modes. All you should know is the Master itself uses Raft to replicate the catalog metadata to backup Masters that act as Raft followers. Again this design is quite different from the masterless/peer-to-peer architecture of Apache Cassandra. In order to efficiently perform read and write operations without intermediate network hops, clients query the Master for tablet location information. Clients are “thick” and maintain a local metadata cache which includes their most recent information about each tablet they have previously accessed, including the tablet’s partition key range and its Raft configuration. At any point in time, the client’s cache may be stale; if the client attempts to send a write to a server which is no longer the leader for a tablet, the server will reject the request. The client then contacts the Master to learn about the new leader. In the case that the client receives a network error communicating with its presumed leader, it follows the same strategy, assuming that the tablet has likely elected a new leader. To reduce network round-trips Apache Kudu clients are smart and keep some cluster topology information. However, contrary to Apache Cassandra drivers with its control connection that allow them to be notified of any topology or schema change, Kudu clients need to query the Master whenever it detects that its metadata are staled. Due to this decoupling, we are exploring the idea of providing the ability to select an underlying storage layout on a per-table, per-tablet or even per-replica basis – a distributed analogue of Fractured Mirrors, as proposed in . However, we currently offer only a single storage layout, described in this section. Pluggable storage engine ! A long requested feature for Apache Cassandra. The idea has been implemented by late Riak which offers 2 distinct storage engines. Goals 1. and 2. are contradicting. No single storage engine can address both requirements efficiently. The hint here is that Apache Kudu may implement 2 distinct storage structures to meet the requirements. Tablets in Kudu are themselves subdivided into smaller units called RowSets. Some RowSets exist in memory only, termed MemRowSets, while others exist in a combination of disk and memory, termed DiskRowSets. At any point in time, a tablet has a single MemRowSet which stores all recently-inserted rows. Because these stores are entirely in-memory, a background thread periodically flushes MemRowSets to disk. Reading all this should remind you of Apache Cassandra MemTable(~MemRowSet) and SSTable(~DiskRowSet). The concept of flushing MemRowSet into DiskRowSet is quite common. When MemRowSets flush to disk, they become DiskRowSets. While flushing a MemRowSet, we roll the DiskRowSet after each 32 MB of IO. This ensures that no DiskRowSet is too large, thus allowing efficient incremental compaction as described later in Section 4.10. Ok so here we are, compaction! A DiskRowSet is made up of two main components: base data and delta stores. The base data is a column-organized representation of the rows in the DiskRowSet. Several of the page formats supported by Kudu are common with those supported by Parquet, and our implementation shares much code with Impala’s Parquet library. This is the confirmation that Apache Kudu has 2 storage formats, one for the columnar data store (base data) and one designed for low latency row-based random updates (delta stores). As expected the columnar data store has a lot in common with Apache Parquet. In addition to flushing columns for each of the user-specified columns in the table, we also write a primary key index column, which stores the encoded primary key for each row. We also flush a chunked Bloom filter which can be used to test for the possible presence of a row based on its encoded primary key. Partition key index + Bloom filter. Those data structures are present in nearly every distributed technologies. Because columnar encodings are difficult to update in place, the columns within the base data are considered immutable once flushed. Instead, updates and deletes are tracked through structures termed delta stores. Delta stores are either in-memory DeltaMemStores, or on-disk DeltaFiles. Here Apache Kudu applies the same design as for RowSets. In memory delta store is subject to flush on disk and on disk delta store is subject to compaction into base data. Implementation details. Please note how Apache Kudu also uses timestamps for conflict resolution (timestamp in Apache Kudu derives from HybridTime, not from the plain wall clock). When servicing an update to data within a DiskRowSet, we first consult the primary key index column. By using its embedded B-tree index, we can efficiently seek to the page containing the target row. Using page-level metadata, we can determine the row offset for the first cell within that page. By searching within the page (eg via in-memory binary search) we can then calculate the target row’s offset within the entire DiskRowSet. Upon determining this offset, we insert a new delta record into the rowset’s DeltaMemStore. Whether some of those data structure are held in memory or in OS page cache does not change the fact that writing requires at least reads in best case. In the presence of an heavy workload where memory becomes scarce, those reads can revert to plain disk seek and add extra latency to the update operations. Insert operations in Apache Kudu do differ from Update. They are not semantically equivalent. Bloom filters to the rescue ! This is the most widely used and most powerful data structures ever for Big Data. Even more used than CRDT or HyperLogLog. Additionally, for each DiskRowSet, we store the minimum and maximum primary key, and use these key bounds to index the DiskRowSets in an interval tree. This further culls the set of DiskRowSets to consult on any given key lookup. Implementation detail to eliminate further non matching DiskRowSets. For any DiskRowSets that are not able to be culled, we must fall back to looking up the key to be inserted within its encoded primary key column. This is done via the embedded B-tree index in that column, which ensures a logarithmic number of disk seeks in the worst case. Again, this data access is performed through the page cache, ensuring that for hot areas of key space, no physical disk seeks are needed. When relying on page cache, you better have a lot of RAM to avoid ever hitting disk, it can be quite painful. Nothing is said about large size DiskRowSets which create giant primary key index files. In this case, OS page cache may not be sufficient Kudu may resort to hitting disk even if the disk seeks are amortized by the logarithmic complexity. When reading data from a DiskRowSet, Kudu first determines if a range predicate on the scan can be used to cull the range of rows within this DiskRowSet. For example, if the scan has set a primary key lower bound, we perform a seek within the primary key column in order to determine alower bound row offset; we do the same with any upper bound key. This converts the key range predicate into a row offset range predicate, which is simpler to satisfy as it requires no expensive string comparisons. Apache Kudu has an interesting system that translate range of primary keys into offset bounds. Of course what is not mentioned in the paper is that this translation between primary key ranges and offsets is done using the primary key index, thus extra reads in memory/page cache or on disk in the worst case. There is no magic. This is the real trade-off paid by Apache Kudu to be able to allow random atomic updates to row. At read time, Kudu needs to read from 2 different data stores (the columnar storage + the delta set) to reconcile the data based on timestamp. And this even not mentioning all the index data structures that need to be read in order to optimize disk access. Because deltas are not stored in a columnar format, the scan speed of a tablet will degrade as ever more deltas are applied to the base data. Thus, Kudu’s background maintenance manager periodically scans DiskRowSets to find any cases where a large number of deltas (as identified by the ratio between base data row count and delta count) have accumulated, and schedules a delta compaction operation which merges those deltas back into the base data columns. Similar to the default SizeTieredCompactionStrategy in Apache Cassandra, Apache Kudu uses some simple heuristic (base/delta row count ratio) to trigger compaction of the deltas back into the base data. If most of the changes in the deltas only impact a few columns, an obvious optimization would be to compact only the data files of those columns. In addition to compacting deltas into base data, Kudu also periodically compacts different DiskRowSets together in a process called RowSet compaction. This process performs a keybased merge of two or more DiskRowSets, resulting in a sorted stream of output rows. The RowSet compaction also helps removing deleted rows. Unlike Apache Cassandra which needs to keep tombstones before a round of repair is performed, Apache Kudu does not need tombstones because of its master/slave architecture. The output is written back to new DiskRowSets, again rolling every 32 MB, to ensure that no DiskRowSet in the system is too large. The knapsack problem is by nature a combinatorial optimization problem for which there cannot be any algorithm to give an exact answer. There are only heuristics that approximate the optimal solution. Some of them are good enough for this kind of task. There is no absolute requirement to pick the optimal sets of data files for compaction. Compacting any set of data file that yields large latency gain at read time is more than sufficient. Because the maintenance threads are always running small units of work, the operations can react quickly to changes in workload behavior. For example, when insertion workload increases, the scheduler quickly reacts and flushes in-memory stores to disk. When the insertion workload reduces, the server performs compactions in the background to increase performance for future writes. This provides smooth transitions in performance, making it easier for developers and operators to perform capacity planning and estimate the latency profile of their workloads. Apache Kudu scheduler is capable to adapt itself to the current workload of the machine, which is a quite nice feature. I’d like to see such feature in Apache Cassandra where compaction tasks are only scheduled when there is enough bandwidth to ensure the compaction does not get stuck forever. To sum up, I would say that the design of Apache Kudu borrows a lot from existing technologies, some good ideas are re-used, as well as known data structures like Bloom filters, B-tree index or Apache Parquet columnar storage. The only new idea is the implementation of HybridTime (we’ll have another blog post discussing that later). At the end of the day, since every technology is bound by the time & space constraints of distributed systems, there is no silver bullet, there are only conscious design trade-offs to enable some features by giving up some others. Thank you for that great post. A lot of points about Kudu are more clear now, by reading it as comparison to Cassandra. Say for analytics one can make the tables already compacted and read only . In Netezza like DB people always do grooming for better performance . grooming is another name for compaction. With Kudu we can co-locate diff tables with primary index like Terdata,Netezza etc. Gives a better design,flexibility in addition to all the benefits of an immutable columnar format.